Concrete is a building material made from a mixture of cement, water, sand and gravel. Known for its strength and durability, concrete is used to construct buildings, bridges and roadways. To ensure a concrete structure will last, inspectors test the strength of the concrete once it has had time to dry. In countries that use the metric system, the strength of concrete is rated using megapascals (MPa). A megapascal (MPa) is a measure of the compressive strength of concrete. It lets inspectors know how much pressure can be applied to the concrete before it cracks or fails. One MPa is equal to one million pascals (Pa); as a pascal is one newton of force per square meter, a megapascal is one million newtons per square meter. The higher the MPa of concrete, the stronger the material will be, and the less likely it is to fail. MPa ratings are used by a wide variety of building professionals. The structural engineer determines the required MPa rating for a structure based on the weight and load of the building and its occupants. Builders and contractors can then refer to MPa ratings when choosing materials, pouring concrete and designing nearby building elements. Inspectors refer to MPa ratings when testing new concrete items, and concrete manufacturers may use these items when recommending products to clients. 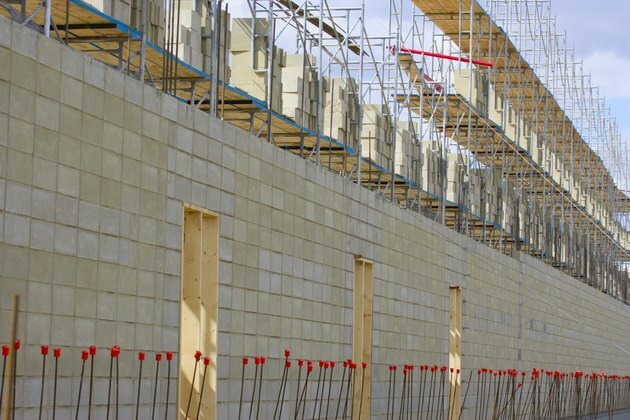 MPa ratings are also used in pre-engineered concrete facilities during design and manufacture of precast concrete panels. The MPa of new concrete is determined using a cylinder-testing process. Inspectors bore concrete cylinders after the surface has dried, or cured, for 28 days. The cylinders must be transported carefully to testing labs, where they are placed on testing machines. These machines usually consist of two heavy plates that are pressed together at either end of the cylinder; the machine subjects the concrete to extremely high compression forces until the cylinder cracks. Multiple tests are performed, and the average MPa is given to builders, engineers and inspectors for review. If the MPa rating is lower than the design parameter, the concrete may need to be removed and re-poured. According to the National Ready Mix Concrete Association, the MPa of concrete ranges from 17 in residential construction to 28 in commercial projects. Any concrete product with an MPa over 41 is considered "high-strength," and is designed for large-scale projects like bridges or high-rise buildings. According to the Portland Cement Association, many in the industry believed that MPa ratings of 76 were the highest possible rating for concrete strength as of the 1970s. As of 2010, however, two buildings in Seattle contain concrete with an MPa of 131. As building technology improves, stronger products may be introduced that could raise MPa potential even higher.